It’s fashionable to talk about chess and mediation in the same breath – as in, mediation is a chess match, one side moves, the other side reacts, makes a move based on the changing ‘board.’ In this metaphor, it helps to think at least a few moves ahead, anticipate the other side, maybe even feint, certainly keep the moves to yourself (and lawyer), and, of course, never blink. 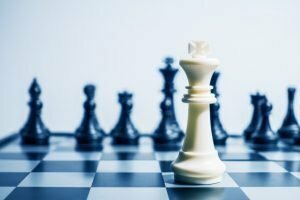 A grand chess match, then, to reach an agreement acceptable to both parties while avoiding having an uninterested third-party make the decision for them. Friends, clients, family have made the analogy, I’ve used it myself – or at least obliquely – over the years. It’s, admittedly, an easy crutch of an image to impart to clients already feeling the stress of starting an action. The thing is, though, it’s not an apt metaphor. In any way, really. See, I’m not a big chess player. I find the rules just a bit too confining. But, I get the game and see it’s complexities. I don’t play on anything close to a consistent basis and I suspect not all that many people do. Chess is kind of like that deep, intellectual book everyone is raving about and everyone is carrying around to Starbucks and the beach and none is reading. Because of this, we are all overlooking a basic but key element of chess: people play to win. Chess is a great intellectual exercise but the minute two people are sitting across from one another make no mistake, it’s about winning. This was really hammered home by last year’s Pawn Sacrifice, the story of the Bobby Fisher – Boris Spassky chess championship in the early ’70s. Toby McGuire did an amazing job portraying Fisher and his mental deterioration. The movie takes the position, clearly, that the stresses of high-level chess played a big part in that deterioration. Winning is everything. “Only one right move.” It’s true for chess. A million, million possible combinations after every move, but only one right one if you want to win. Need to win. It’s not remotely true in mediation. A single individual does not win at mediation, the parties win. They win by putting aside the need to win, not going to war, not searching for the ‘right move’, working it out, and not letting a stranger decide for them. In this regard, the only thing that chess and mediation share is the concept of the sacrifice. But for completely different reasons to completely different ends. I’ll be sure to correct people who use this comparison from here on out, especially clients – I’d hate to give a serious chess player the wrong idea. Click to learn 10 Things Other Lawyers Won’t Tell You..